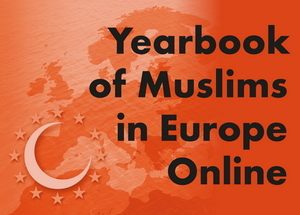 The Yearbook of Muslims in Europe is an essential resource for analysis of Europe’s dynamic Muslim populations. This comprehensive annual reference work summarizes significant activities, trends and developments, and features the most current statistical information available from more than 40 European countries. the family/descendants of the Prophet. reform movement founded in India in the 19th century and widely regarded by other Muslims as heretical. movement with roots dating back to the twelfth century, often esoteric in nature and with links to Shi’ism; today especially strong among Turks and Kurds of Eastern Anatolian origin. Shi’i religious observance, forty days after the day of ‘Ashura’, to commemorate the death of Husayn ibn Ali (third Shi’i Imam). festival on the tenth of Muharram (first month of the Islamic calendar) marking the death of Husayn ibn Ali (third Shi’i imam) at the battle of Karbala in 680; a central Shi’i religious observance. festival (esp. Turkish for ‘Id, q.v). a Sufi order with strong Ottoman roots; marginalised during the mid-19th century Ottoman reforms and banned with other Sufi orders by the Turkish Republic in the 1920s. specifically the Afghan-style female full body covering, including the face; in common usage in Europe now taken to mean any form of female full body and face covering. central Alevi communal dance ritual similar to the sema ritual of the Mevlevi Sufi order. place in which Alevi cem ritual is performed. Islamic term for missionary or proselytising activities. “cram school”, type of specialised school. a common term for Sufi. ritual practised by devotees of a Sufi tradition. statement of opinion on a point of theology or law issued by an authority in response to an application. person who knows the Qur’an by heart. the annual pilgrimage at Mecca at the beginning of the twelfth month of the Islamic calendar; the highpoint is ‘Id al-Adha. migration of the Prophet and his followers from Mecca to Medina (Yathrib) in 622 CE. popular centre of learning and devotion in Shi’i Islam. Feast of the Sacrifice during the pilgrimage at Mecca. festival ending the fast of Ramadan. breaking of the fast at the end of the day during Ramadan, increasingly celebrated in invited company by mosques, churches and other organisations. religious leader, most commonly the one who leads the congregation at the regular prayers; also used about prominent scholars and spiritual leaders. Among Shi’i Muslims, a legitimate leader of the community. sacrifice, as in Turkish kurban bayramı (‘Id al-Adha). the “night of power,” 27th Ramadan, the celebration of the revelation of the Qur’an. school of law or theology. school at any level, usually elementary and high Islamic. council or body governing Muslim community organisations, in Southeastern Europe in particular (see also meshihat). birthday of the Prophet Muhammad. council or body governing Muslim community organisations, in Southeastern Europe in particular (see also majlis). the person who calls to prayer. person who issues fatwa; in some modern states the title of the leading Islamic official. office or institution of mufti. maintenance and/or alimony payment after divorce. New Year in the Persian/Kurdish/Turkish tradition. marriage formalised in the Islamic tradition. literally meaning “sacrifice” and often used as a reference to meat of animals during ‘Id al-Adha at the end of the annual hajj to Mecca. “dean of the scholars”, applied in some countries (Eastern European in particular) to the official head of the Muslim community. the ninth month of the Islamic calendar, the month of fasting. governing council within centralised Muslim community organisations in Southeastern Europe, usually headed by the chief mufti or ra’is al-‘ulama’. Tatar and Bashkir cultural festival. alms given at various occasions, often in connection with a religious festival. prescribed prayers five times a day. Islamic law and ethics, the principles of good Islamic behaviour. leader of a congregation, especially of a Sufi character; honorific for someone learned. title of leading Muslim scholar or head of official Muslim community organisation in a country; originally, an Ottoman title and therefore used in Muslim communities in regions that were part of the Ottoman Empire. the branches within Islam which trace their authority through the descendants of ‘Ali, the Prophet’s nephew and son-in-law. They make up 12–15% of the total number of Muslims worldwide. commonly used for shari’a compliant financial bonds. the majority tradition within Islam, sometimes (mistakenly) called “orthodox”. a Sufi meeting place (Turkish). tomb of a venerated person (“saint”), often the object of popular devotion. the global community of believers. the lesser pilgrimage at Mecca taking place at times other than hajj. religious foundation (of property) providing income for religious, charitable or educational purposes. a Sufi meeting place (Arabic). visiting family graves or tombs of Muslim saints at set times of year.